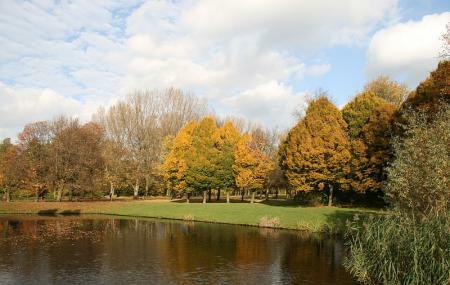 Beatrix Park is considered to be one of the nicest parks in Amsterdam and a great attraction that has been in the scene since 1938. Designed by popular architect Jakoba Mulder, it was originally a romantic park that was later redesigned with a more modern touch post-WWII. The green space of the entire area sits behind a large lump of its land dedicated to RAI congress centre that houses one of the biggest exhibition halls ‘Parkhal’. Not only the local park is nice and clean but it is also home to many small pavilions that serve as a reminiscence of 1972 era. As you stroll through the park, you will find yourself taken back to the time when the English gardens was very popular and in trend. The small lake and open landscape make it a great place to hang out with family and enjoy some quiet leisurely time. Its prominence has even provided it with a status of ‘City Monument’ in 2005. Barbeques are prohibited in Beatrix Park. Incredible city park with biking and running trails. Play area for kids is small but clean and well-provisioned. Peaceful ponds with sitting areas nearby. Highly recommended. Awesome park with canals, play area and swim baths for kids. When the weather's fine it's lovely to just chill out with your friends, family and pets.